Rare Parker Pens Display Advertising Pen. Wood and metal. 29 inches in length. $550 plus shipping. 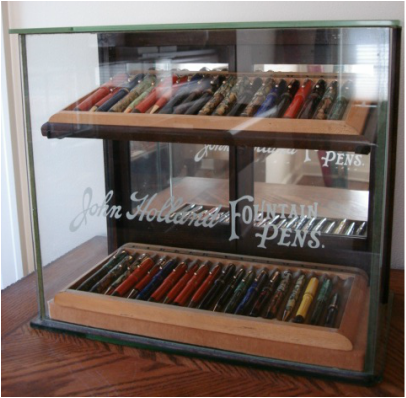 John Holland vintage display cabinet. $950 plus shipping. Excellent condition. Original mirror doors. One small chip in glass at lower right front corner (see 5th picture below). 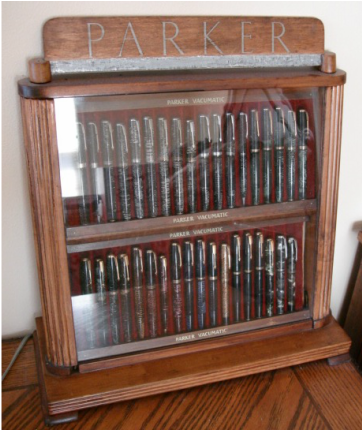 Parker Vacumatic vintage display cabinet. $1,200 plus shipping. Excellent original condition. Original paint and display trays.